Featured on the Dr Oz show in early 2010 and named Alternative Medicines Best New Products in the same year. This easy to use instrument is used to alleviate respiratory ailments such as asthma and shortness of breath, sinus conditions, allergies and flu. 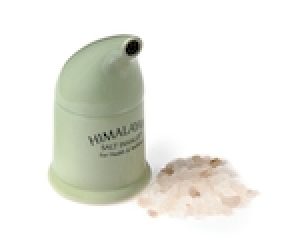 This all-natural, pollutant-free device is able to promote good health through the anti-bacterial properties of the Himalayan Crystal Salt. Additional use is to put a drop or two of the purest essential oils in this inhaler. Bring it aboard a plane for a a long flight. You will arrive feeling amazing in your throat and lungs and in much better mood than normally. Just pick an oil that you find irresistible. Also make sure it is good for YOU, and that it is of highest quality. Comes with salt inside. Should be enough for a few months normal use. My husband caught a severe cold at a convention. Using the salt inhaler, rest, fresh fruits, salads and chicken soup his health rapidly improved. I came down with symptoms yesterday and used the salt inhaler immediately every time my throat felt raw. I use the salt inhaler daily because of my asthma history. All my asthma attacks have disappeared. I have been medicated for asthma since I was 16. Makes a great gift, especially for the smokers in the family! This inhaler I find to be very helpful with my allergies and also for my cold. I find I don't cough as much. It loosens anything in your chest to keep it clear. Copyright © GoEarthing. All Rights Reserved.